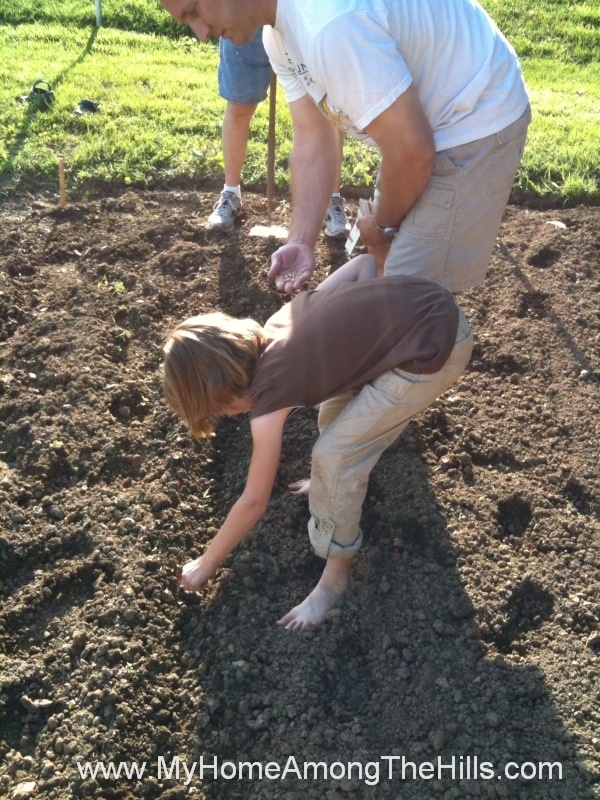 We always start the garden in early March by planting seeds…especially for tomatoes, cabbage, broccoli and peppers. By the time May 10 (our somewhat official last frost date) rolls around, we have pretty good looking plants ready to go into the ground. We plant by the signs too so we are particular about getting stuff planted at the right time. We got our seeds planted at the right time and then we also go the plants stuck in the ground at the right time. 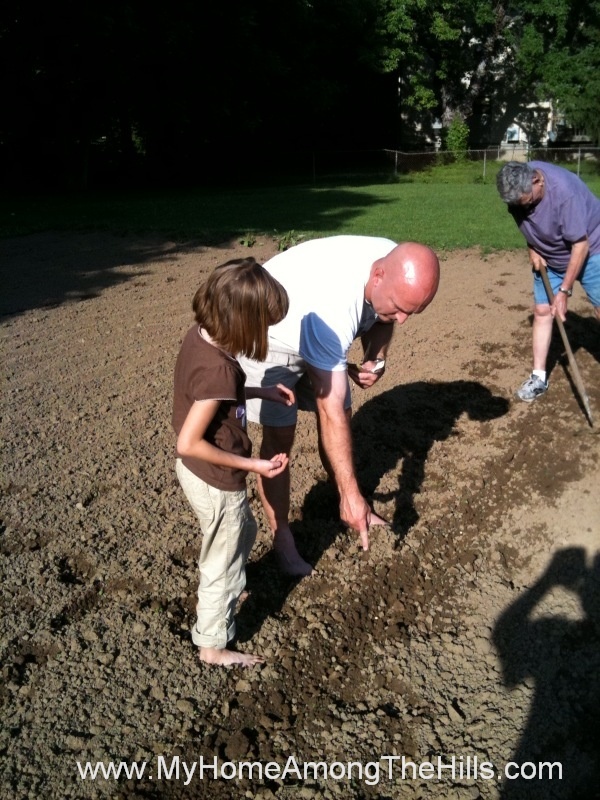 This year, we are participating in a test of “planting by the signs” sponsored by Blind Pig & the Acorn. Basically we planted some squash seeds on the “right” date and some on the “wrong” date. Lots of people are participating so it should be interesting to see what happens. Anyhow, we got lots of stuff in the ground early in May but some stuff we have had to work on for timing reasons. Two weekends ago we finally got the last of the garden planted. Abigail was a huge help in getting our dry beans and pumpkins planted. 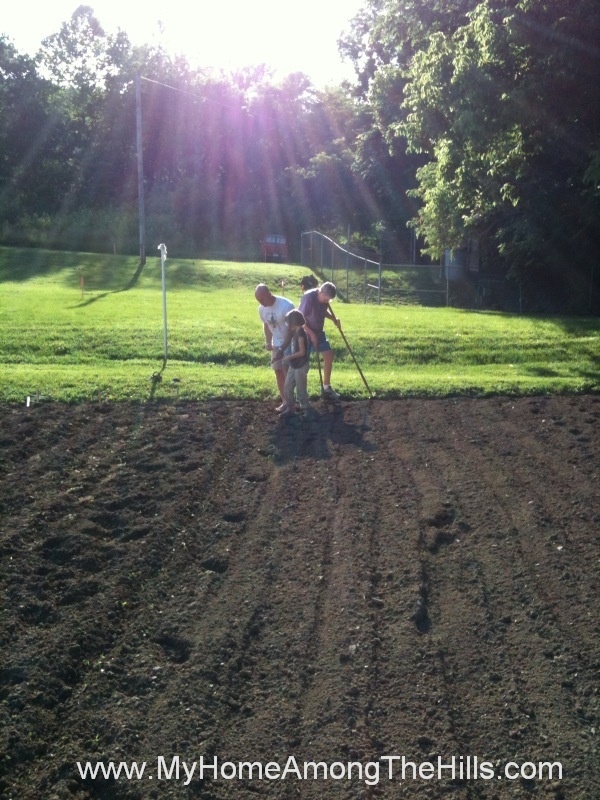 She marked our rows, planted some seeds, covered some seeds and laughed a lot. It was a blast being all barefoot in the garden with my smelly little girl! We checked the garden this weekend after a good rain and everything was up and looking good. Emily’s Grandpa swears he went down in the morning one day before the rain and nothing was up. A few hours later after the rain, everything had come up! That would be cool to see! So, we are planted and are mostly still weed-free! Typically we stay ahead of the weeds pretty well so I think our time in the garden is about to increase like crazy! No more clean fingernails or soft feet in our household! I will be very interested to see your experiments with planting by the signs; love that you did a trial of planting some on the “right” date and some on the “wrong” date! .-= Taylor´s last blog ..What’s growing? =-. YAY, I love seeing this. So good to see those kids out there helping. I wish I had a nice big garden like yours. Nothing like the wondeful feeling of dirt squishing beteew your toes! Love it! WOW…I think I need to proofread before I hit the submit comment button! That’s not a GARDEN, them’s CROPS!!! Lots of chores over at Old McDonald’s Farm! I love the pictures of you with Abigail. Precious. You’re a good Dad. Thanks for the shout out-and for playing along! Lovely garden, Warren. Is this in your back yard? It looks huge–and flat! Our gardens were all hillside plots but over the years they’ve kind of terraced themselves into mostly flat ground. It’s interesting to see how our use of land impacts the land’s contours. Even the paths the dogs follow end up changing the landscape slightly. I’m interested in this planting by the signs test. I don’t do it because we have to plant when the soil is right and we’re home to get the work done. Barefoot in the garden? I have yet to try that. I wear crocs, so my feet get dirty and black. YD – you have to try barefoot! Shayne – it is really big when it comes to weeding time! Taylor – it grows some serious food for sure! Tipper – Our best bet is running the tiller between rows…but gadzooks I hate weeding around the plants! That’s going to be wonderful! Neat experiment too. I love the large garden plot all laid out. This year I went early, and it seems to be working out.